Topnotch global smartphone brand Vivo has officially brought the world-first in-display fingerprint technology in smartphone to the Philippines at the launch of the Vivo X21 last June 21 in Manila. The event, graced by the brand’s hottest influencers and well-attended by industry partners and member of the media, featured football fever as Vivo is the official smartphone sponsor of the FIFA World Cup Russia 2018. The event showcased official FIFA merchandize with adorable Vivo mascots showing the crowd how to do the #PassTheSwag dance in a brief but fun dance presentation. 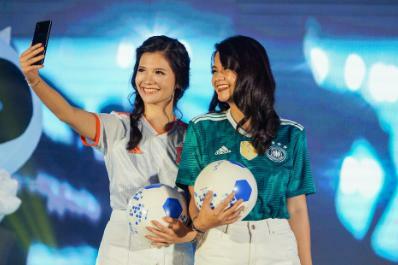 Vivo’s local brand endorsers were also seen donning FIFA football jerseys of various teams: blogger-sisters Vern and Vernice Enciso were sporting jerseys of team Germany and team Spain, both victors of FIFA World Cup 2014 and 2010 respectively. Meanwhile, Chienna Filomeno and Maris Racal were proudly wearing the jerseys of Brazil, the five-time FIFA World Cup title holders. Soulful acoustic star TJ Monterde, on the other hand, showed expressed support for Portugal’s football superstar Christiano Ronaldo. Even the Vivo team composed of Ms. Hazel Bascon, VP for Sales, Ms. Annie Lim, Brand Director, Mr. Patrick Villareal, and Ms. Jomarie Morales were also bitten by the FIFA fever with their football-inspired garb. The brand endorsers were more than thrilled to be a part of the Vivo X21 launch. Verniece and Vern, author of a popular travel and fashion blog, attributes their beautiful page content to the Vivo X21, “Part of our job is taking photos and capturing memories all over the world. Vivo X21 is our new travel buddy. What we super love about the new smartphone is the dual rear camera.” The sisters also love the X21’s AI Super HDR feature that offers crisp photos for posting online. Singer TJ, who is also a gamer on the side, is impressed with the X21’s Game Mode. “It allows me to block alerts while I’m playing games so I can focus on winning Mobile Legends,” TJ gushes. TJ is referring to long-time love and fellow Vivo endorser KZ Tandingan. Vivo is known to push boundaries in the name of innovation. The Vivo X21 is proof of this with its impressive under-glass fingerprint sensor complemented by other state-of-the-art offerings such as an impressive 19:9 Fullview Display which produces a more immersive mobile video- watching and gaming experience, and an AI Face Beauty-enabled camera that boasts of dual pixel sensors which creates vivid pictures whether in low-light or backlight situations—perfect for everyone’s travel shots. light tones in a photo so one can take shots anytime, anywhere.